I hadn’t been to Carlyon Bay for over ten years and, having heard great things about the new developments there, was really keen to visit. 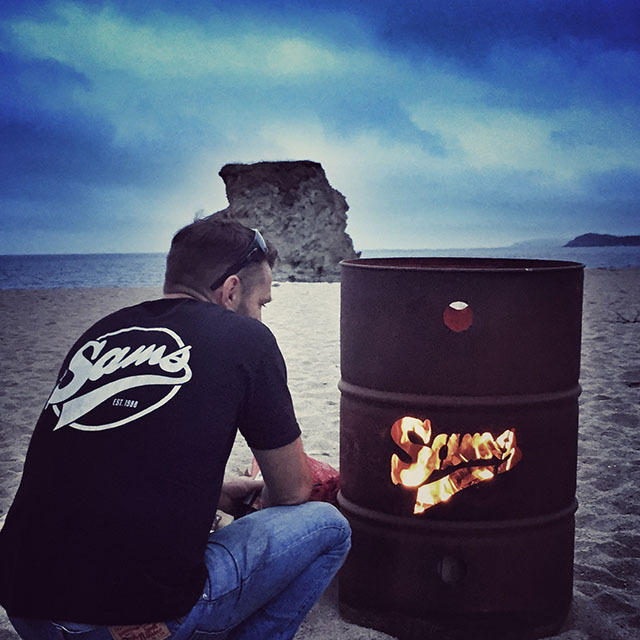 A summer beach banquet, featuring some of my favourite food outlets Sam’s and Ostraca, seemed like a perfect excuse to head down to the south coast. The bay is undergoing a transformation, and the developers have rebranded the venue as Carlyon Beach. It’s going to be several years before the place is finished; in the meantime there are going to be regular events held on the newly enlarged beach. 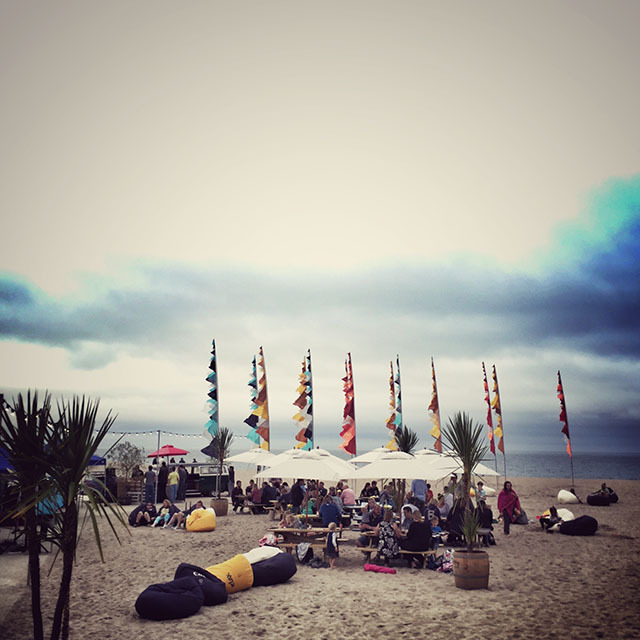 Unfortunately the evening for their first event, a beach banquet, was grey and mizzly. A typical summer’s day, we joked, as we drove through heavy rain near St Austell. How we laughed. 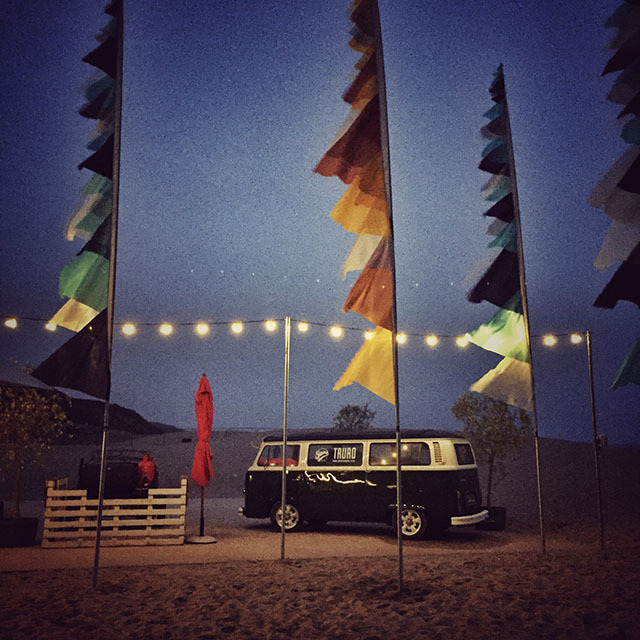 But when we got down to the beach (free parking – result!) the atmosphere was warm, and the sun did its best to fight off the clouds. The organisers had arranged for a selection of traders to provide food and drink. 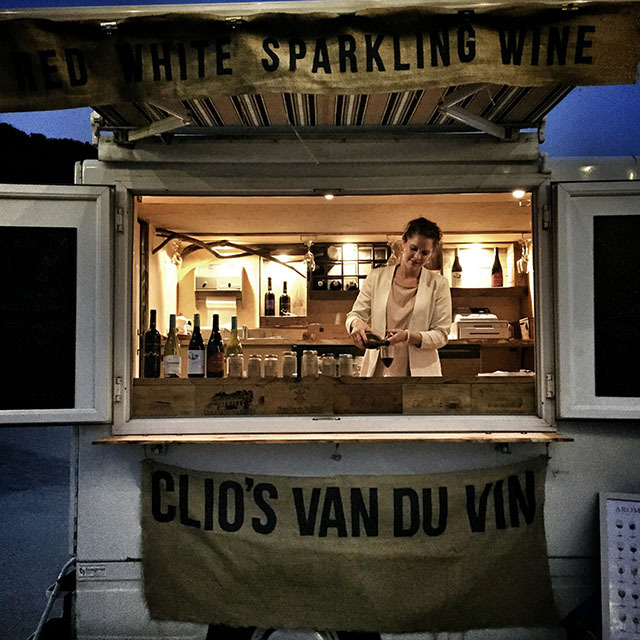 I particularly loved Clio’s Van du Vin, which was on its second ever outing. I’ve a feeling Clio and her van are going to become very popular. The children were given amazing goodie bags which kept them occupied at the tables – when they weren’t piling on top of each other on the beach bean bags, running races between the flags, or messing around with the beach games which had been set up for them to play. Michael Collings provided an acoustic backing to the evening, which was so good it took us several songs to realise that he was actually there, playing live on the beach. 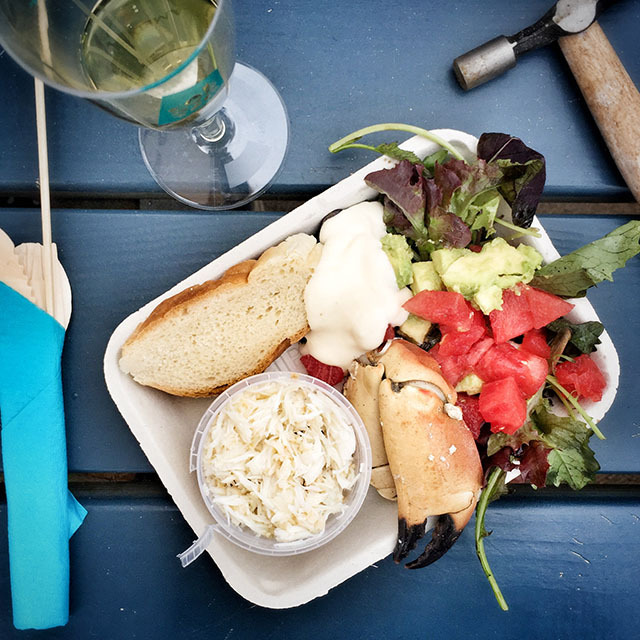 The meal kicked off with Mylor crab from Fal Oyster’s pop-up venue Ostraca (which is set up at the beach for the season). 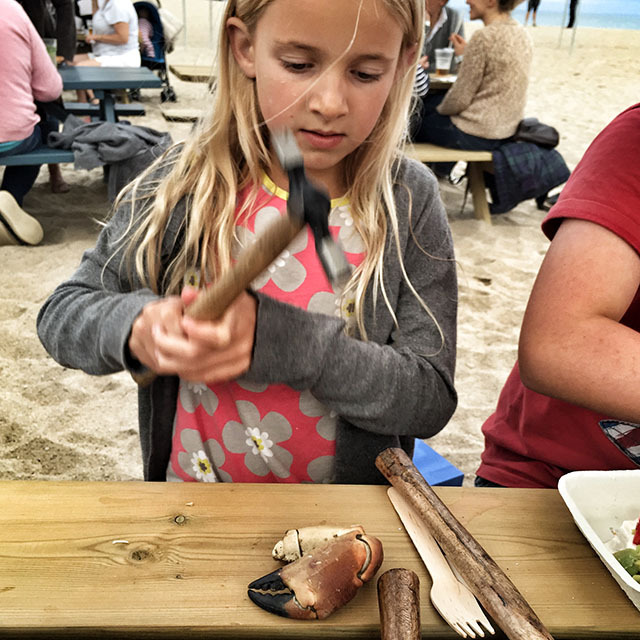 We tucked into hugely generous portions of crab meat, crab claws, salad and pots of freshly made mayo, with hammers on each table to break into the claws, much to the children’s delight. 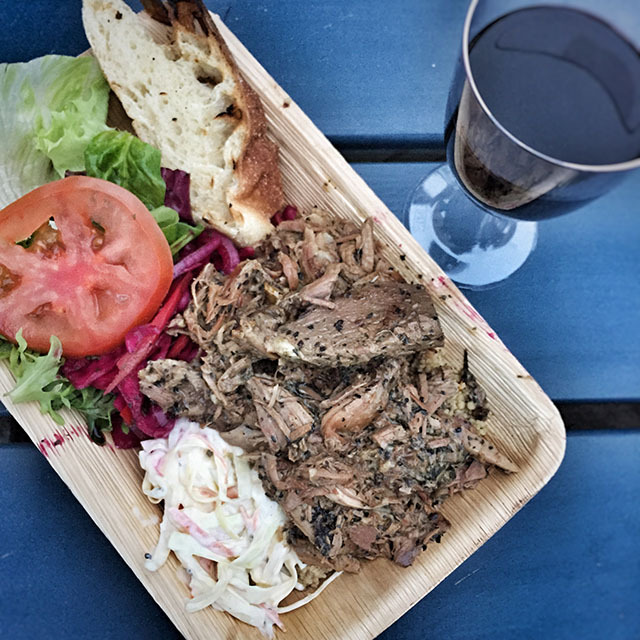 Sam’s have had their popular beach café at Carlyon for two summers now, and they provided the main course of deliciously succulent spiced Moroccan lamb, with couscous, salads and chunks of bread. 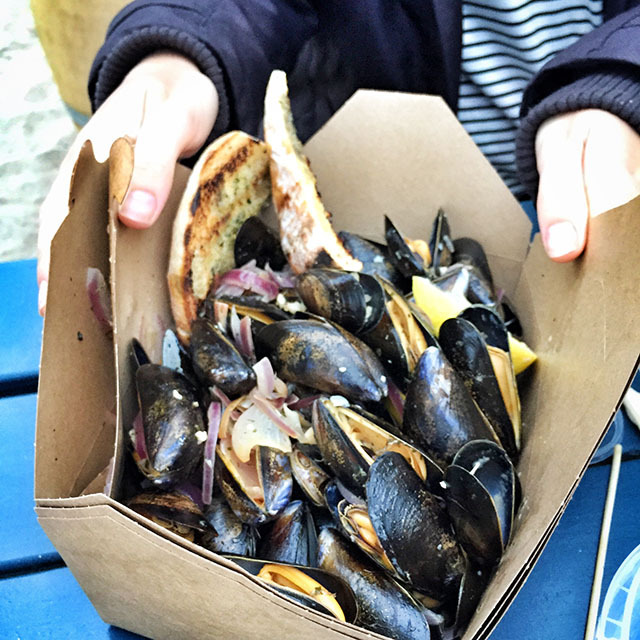 The lucky children had proper burgers; non-meat-eaters were treated to enormous boxes of mussels. After a slight power-failure-blip, Proper Pancakes produced dozens and dozens of fluffy American-style pancakes. My children chose Jelly Bean toppings; I went for a (slightly) more sophisticated caramelly banana-y concoction. As the evening slipped into darkness, and we had run out of extra layers of clothes to put on, we reluctantly made our way back up the steps to the car park. This is the kind of place where you could happily wile away hours. With superb food, fine wine, fabulous friends and, if you’re lucky, a few rays of sunshine, what more could you ask for? The next banquet will be held at lunchtime on bank holiday Monday 31 August. Tickets are priced at £25 each (£13.50 for children), and are available online. 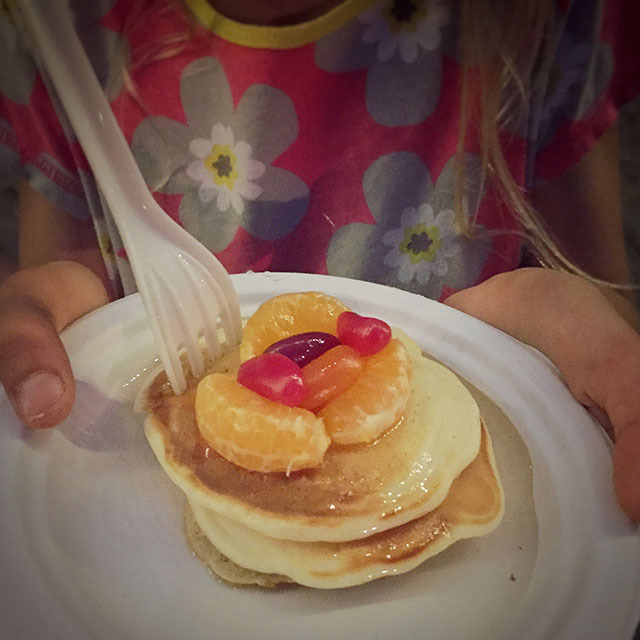 The three courses will be provided by Ostraca, Pompier and Proper Pancakes, with wine, beer and soft drinks available to purchase. To keep up to date with news from Carlyon Beach, like them on Facebook or follow them on Twitter.